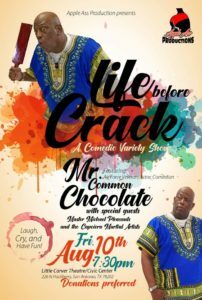 Mr. Common Chocolate and members of his Family Present: A standup Comedy and Entertainment show. Featuring: Capoeira Luanda of San Antonio and Austin, TX, Chaotic Harmony, Yakira C! and others. This comedy show is not suitable for ages 18 and below.